ONE MACHINE, ONE OPERATOR, LOTS OF TOOLS. The best part about owning a tractor is putting it to good use. Regardless of the size of your tractor, a number of implements are available to maximize the usefulness of your machine. Whether you have a compact utility tractor or a large four-wheel-drive, the three-point hitch can be matched to various types of mowers, tillers, rear blades, box scrapers, cultivators and rakes to turn any tractor into a multi-purpose farming tool. 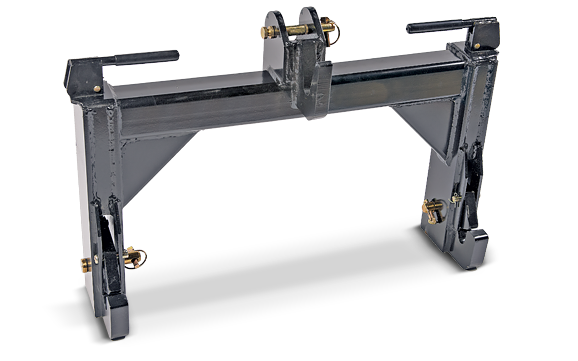 Mounting 3-point hitch implements can be time consuming. Your tractor must be aligned with the implement almost perfectly, which can often take several attempts. Hooking up the hitch pins and adjusting the sway links can take time, and usually several trips back and forth from the driver’s seat. A Farm King Quick Hitch can make light work of hooking up implements to the 3-point hitch. Attach the Quick Hitch to your tractor’s 3-point hitch just like you’d hook up a piece of equipment. When the sway links are set you don’t have to adjust them again, and you can leave the Quick Hitch on your tractor all the time. With the Quick Hitch attached, it’s easy to hook up all sorts of equipment - simply pull open the lock on the Quick Hitch, back up to the equipment and lift it. Then lower the handles into place, hook up the PTO or hydraulics, if required, and you’re ready to get some work done. The Quick Hitch is a faster method of attaching an implement to the tractor because it allows you to back up to the implement, lift it, and it’s ready to go. Every time!